Too many followees and it's hard to keep track on your favorite ones? Don't worry, SteemPlus is here for you! In this new version, we have added a way to track the new posts from your favorite users. Let's see how to use this new "Favorite" feature. Clicking on it again will remove the user from your favorites. The list of your favorites and their latest posts are stored using Chrome local.storage module. Every time you're browsing the posts on Steemit, a script will run to compare the latest post from each of your favorite users (limited to 10) and compare it to the last one stored. Clicking on the username will take you to the user's blog and update the local.storage so that the New icon won't show up until next post. 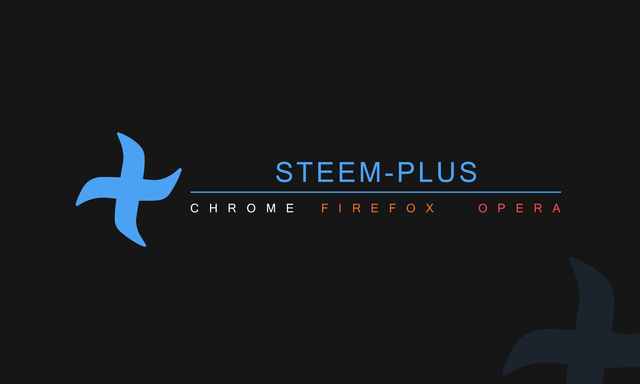 To know more about the multitude of other SteemPlus features and get how to download and install it, please check our latest big release. Hope you'll enjoy this new feature! It should be on the Store within one hour (you need to update manually if you use Firefox). Then you could also generate notifications based on these lists and have like a number bubble for how many new posts there are to read. That s a good idea for a future development indeed ! Excellent stuff, another excellent (added) feature. I'm glad to see you continue. Great feature! This is just so amazing. I keep wondering why these things aren't done by Steemit themselves. Steemplus continues to do the job of steemit day after day. Kudos for the great job you guys are doing! Awesome @steem-plus. And great that you explain so fully yet simply at the same time! After I use this plugin, it really gives me a safest and easiest workspace, it motivates me to be more consistent in using the platform. I sincerely thankful to you guys, keep it going will never stop supporting plugin and as mush as possible I will share this plugin to the people. Do I need to do anything to update the extension? Only if you re on Firefox, in this case you need to delete it and redownload it from Chrome Foxified. Then I guess I'm lucky my favourite browser is Chrome, then. Just as a suggestion, you should also support Microsoft Edge as well. I kinda like it. Though suggestions should properly go on Utopian, right? as always making the job easier for us ... thanks for this great update will be very useful. Thanks @stoodvek and @cedricguillas for making this update to steem-plus from my suggestion. Cant wait to use it. Thank you for the information ... It really helped me. wow - this is great! Thank you so much!!!! I like to see my voting power at all times, but currently i can only see it when viewing one of my profile pages. 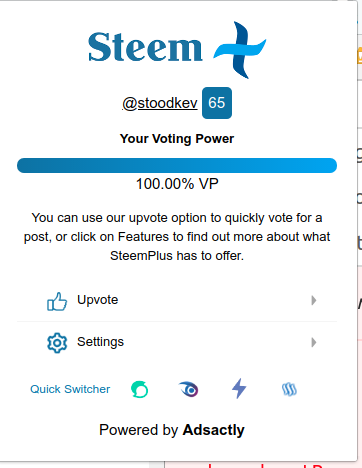 What do you think about adding the current user's voting power to the top bar of steemit.com which is visible on every page? Hey matt! Glad you like it! Currently, there is a second option to see it from anywhere, just by clicking on the SteemPlus extension button to open the popup. Once the searchbar expanded, there is not so much place left on the Steemit topbar on a 13" laptop for example, so it would be hard to add it there again. This is just the sort of feature we want. Thanks for the update. Thank you for this wonderful application, I know I was one of the first users and have never stopped liking all of your updates. I definitely will consider, I mean I will definitely choose you for witness when I'm ready to give up my proxy that I delegated to someone I know researchers all of the witnesses. Thank you very much for the new feature! I'm using Steem-plus since 2 weeks now, it helped me already much and I love it. You re welcome Tom! Enjoy! Is there a way to filter out re-steems? Sometimes I just want to read what the authors I'm following have written. You can filter resteems using FeedPlus. Thanks! I have a suggestion. How about to add a button near comment with a direct link to this comment? Great update, I 'm looking forward to using it! edit - uninstalling and reinstalling the extension did the trick. Working now. Thanks for the great update! Sadly, that s the only way on Firefox. If you re on Chrome or Opera, you can just force the upgrade or close and start again your browser. I just put out a steem request, may I trouble you to Take a Look and offer input or advice? I already tried it! I love it ! You do very helpful to trace our favorite, this is the discovery of a good. How cool! In fact, I just posted on this subject as a feature request: Tracking "tribes" or "circles of friends." It's a fantastic add-on to Steemit, and the timing is perfect for me. Thank you. Hello, I switched to Brave ( https://github.com/brave ) on W10 and Android, and would like to know if there is a work-around to use Steem-Plus on Brave? i really like this feature. Now I don't have to sift through all the other stuff that's in my feed to see the posts from some of the more important users I follow. :) Love what you guys are doing and keep it up! I love this feature! I can't wait to try it out. Keeping up with our favorite users is very hard! I have a question about beneficiaries - How can we tell that they received the SP? I had a post last week with beneficiaries and I don't see anything in their wallet from it. I just did another one today with beneficiaries and it is for an initiative so I really hope I did it right. Hi, you can press Shift Alt D from your post to get to steemd.com, then in advanced mode you can see the list of beneficiaries. By default, beneficiaries do not appear on Steemit wallet, but you can check beneficiaries payout on steemworld.org for example. Oh okay, I see now. Thank you so much for the response.